INVESTIGATORS ARE SEEKING to shed light on how a California couple arrested on suspicion of torture were able to keep their 13 malnourished children — ages two to 29 – confined in their suburban home in grim conditions with no one noticing. Associated Press reports that California authorities say the mother of the 13 children was “perplexed” about why police came to their home. Riverside County sheriff’s Captain Greg Fellows described the reaction of 49-year-old Louise Turpin but didn’t know the reaction of the father, 57-year-old David Turpin. The children, some of them chained to furniture, were described as weak and small for their age. Fellows called it torture. The abuse was discovered when a 17-year-old girl jumped out a window and called 911 on Sunday. Corona Regional Medical Center CEO Mark Uffer says his facility is treating seven of the adult children. Uffer says they are small and clearly malnourished but are stable and very friendly. James Turpin of Princeton, West Virginia, told The Associated Press today that all 13 children are David Turpin’s biological kids. He said none are adopted. Sheriff’s deputies found some of the children shackled to their beds in filthy conditions after receiving a 911 call from one of the children, a 17-year-old girl who managed to escape. She was so emaciated that officers said that at first they thought she was just 10 years old. “Further investigation revealed several children shackled to their beds with chains and padlocks in dark and foul-smelling surroundings, but the parents were unable to immediately provide a logical reason why their children were restrained in that manner,” the Riverside County Sheriff’s Department said in a statement. Deputies located what they believed to be 12 children inside the house, but were shocked to discover that seven of them were actually adults, ranging in age from 18 to 29. The victims appeared to be malnourished and very dirty. 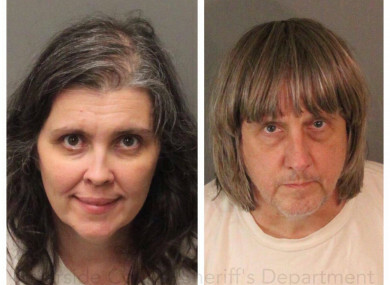 The parents, 57-year-old David Allen Turpin and 49-year-old Louise Anna Turpin, were booked on suspicion of torture and child endangerment with bail set at $9 million each. Turpin’s parents, who live in West Virginia, told ABC News they were “surprised and shocked,” adding they had not seen their son or his children in four or five years. “Never really thought anything of any sort would happen like that,” Reyes added. The Spanish-style stucco house where the victims were allegedly held is located in a middle class neighbourhood of Perris, a small city some 110 kilometers southeast of Los Angeles. Three cars were parked at the home, along with a van with tinted windows. One of the cars, a blue compact, had a child’s seat in the back. A Facebook page under the name of David-Louise Turpin includes pictures of the couple staging renewals of their wedding vows from 2011 to 2016, with their children present. Nine girls, all with long dark hair, wear matching fuchsia plaid dresses with white tights, while a baby girl is dressed in a bright pink dress. Three boys, their dark hair in bowl cuts like David Turpin, are dressed in suits with fuchsia ties. An April 2016 photograph shows the same smiling children and the couple wearing jeans and red t-shirts that read “Thing 1,” “Thing 2,” “Thing 3″ and so on — a reference to the mischievous twins in the popular Dr Seuss book The Cat in the Hat. In another September 2015 photograph, Louise Turpin holds a baby wearing a t-shirt reading “Mommy loves me”. David Turpin is registered in state records as head of a private school. The address matches that of the Turpins’ home, and the children were apparently home-schooled. According to court papers, the couple filed for bankruptcy in 2011, at a time when David Turpin was working as an engineer for defence contractor Northrop Grumman, earning $140,000 a year. “They seemed like very normal people who fell into financial problems,” Ivan Trahan, the lawyer who represented them in that case, told The Los Angeles Times. - © AFP 2018 and contains reporting from Associated Press. Email “Mother 'perplexed' after she and husband arrested over keeping their 13 children 'captive'”. Feedback on “Mother 'perplexed' after she and husband arrested over keeping their 13 children 'captive'”.